Our LED pattern projectors are specifically designed for the most demanding 3D profiling and measurement applications. Triangulation techniques require that structured light be directed onto an object at a considerable angle from vertical. Tilting the light source pattern becomes essential to ensure that patterned light is properly and homogeneously focused across the entire sample surface. This pattern projector integrates a precision tilting mechanism based on the Scheimpflug design. This ensures that the focus doesn’t change when the pattern is tilted. 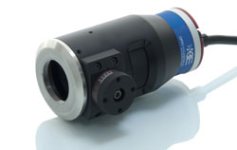 The internal focus mechanism offers the maximum optical throughput. This light is available with white, 365 nm UV, 385 nm UV, 405 nm UV, 460 nm blue, 520 nm green, 630 nm red, 890 nm IR, or 940 nm IR LEDs. Visible lights are available with either 1 watt or 3 watt power; UV and IR are available with 1 watt power. Input voltage is 12 – 24 VDC. A variety of interchangeable optic patterns are available. Choose from standard line, stripe, crosshair and grid patterns, or specify the custom pattern ideal for your project.